Here’s an easy word search for beginning puzzlers of all ages. 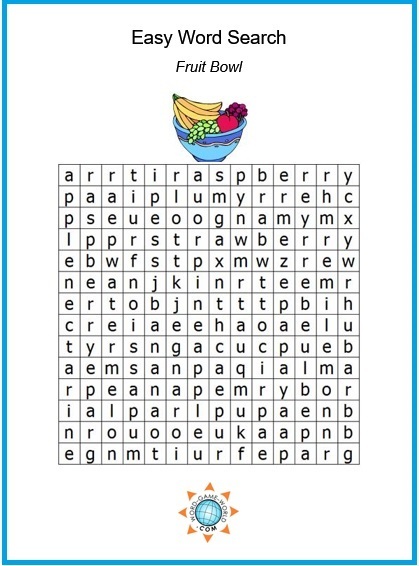 Fruit is healthy to eat and fun to find in this simple puzzle page! Did your favorite fruits make our list? Search for the names of 25 fruits. (The names appear up, down, left-to-right or right-to-left. None of the words in this puzzle run diagonally.) When you find the name of one of the fruits in the puzzle, circle it. Then cross it off in the word list. Double-Letter Animals - This one "otter" be a lot of fun, no matter your age or location. For an extra puzzler, how many more double-letter animals can you name that are not on our list? Kids' Word Search Assortment - View our entire set for kids. 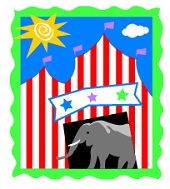 Teachers and parents, these are a fun way for children to practice those all-important reading and spelling skills. Baby Word Search Just one from our collection. Fun to solve on your own or at a baby shower! Popular First Names for Boys and Girls - Find the 15 most popular of each from 2000 - 2008. Can you guess which names are on the list? Is yours one of them? Fall Word Search - Fun and easy, for any time of year. There are only 15 words to find in all. Books of the New Testament - This one's not too difficult, except maybe for the extra twist we've added! Why not try some more of our simpler word games and puzzles? Easy Crossword: Famous Pairs If you can complete pairs like Macaroni and ____ , you can solve this crossword puzzle! Our most popular easy printable word find. Easy Crosswords - There's something here for almost everyone! Kids' Crosswords - More word puzzle fun, for kids of ALL ages. 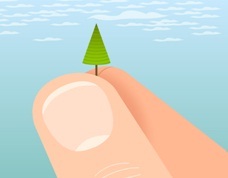 So Tiny 10 scrambled words used to describe very tiny things. Can you solve them in a tiny amount of time? Occupational Hazard: Don't miss this fun puzzle with a twist or two!